“Life is uncertain and difficult until you experiment it or put on a trial. Life will treat you better, once you start confronting it and relishing it as long as you are alive”. For this firm belief, Anupam Mishra deserves our praise for his strong zeal toward living the robust and fulfilling life. Mr. Mishra is a postgraduate in Commerce from Calcutta University. 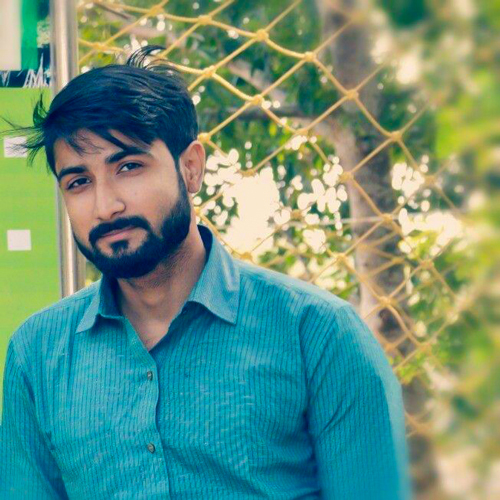 Presently, he is pursuing LLB from Burdwan University and at the same time, he is the CS Finalist aspirant. He is pursuing his professional studies and also works along with TATA Consultancy Service, India’s Top IT Company as a Financial Analyst from last 3 years. Mr. Mishra, a man of boundless versatility, smoothly administers his professional, educational, and fitness life. Being an Asthma patient, he had difficulties with breathing and never thought of becoming a Marathoner but currently runs a 42 km marathon. Way back, he was a person who was afraid of a mere 100-meter run, but today he actively participates in various running events across India. The multiple categories of the run happened to be the stepping stones for his accomplishment, that altered the journey of an Asthma patient to a Passionate Runner. Unlike a Runner today, Mr. Mishra was not a morning person. Despite his parents insisting him to wake up early, he never did throughout his school and college times, nor did he went for a walk. But today, he wakes up early as 4 am and goes for a practice run. Begun with a purpose to recover from the ailment, this habit not only restored his health but helped him progress mentally. During his college days, he became obsessed with bodybuilding. So, from 2011- 2014 he frequently started going to gym. With 68 kg body weight, he never gained the stamina that he coveted in himself. As far as the 100m or 200m run was concerned, he usually was deprived of the stamina or vigor when his friends would ask him to participate in the run in his locality. Besides, he was mentally conscious about his breathing difficulty and hence he ended up suffocating or end up vomiting when he attempted for a run. 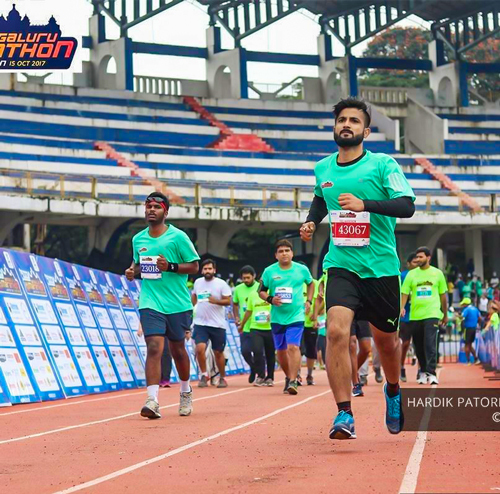 A boy with a dream to become a Company Secretary and a Lawyer by profession joined TCS in the year 2015 but never imagined participating in a marathon. 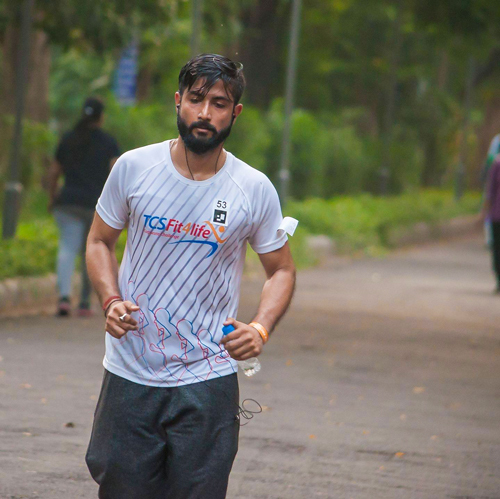 He ventured in his journey of running with TCS Fit4Life 2017-10 km Run. He was consistently motivated by his colleague Miss Lakshmi Parakh at his office and was told to participate for the same. Unexpectedly, he finished the 10 km run in 75 mins (1 hr. 15 mins). It was a moment blended with disbelief and joy, a moment inexpressible! Tears of joy rolled down his cheeks and he stood startled witnessing the fact that he finished the run without a trace of breathing issue. That very moment imbued courage and remodeled his perspective and life forever. That moment of achievement was the inception of his journey to get away from his subconscious or mental anxiety. Till Date, he has completed 3 full Marathons (Tata Mumbai, Shriram Bangalore & Vizag Navy Marathon), 7 half marathons, One-25 km (TSK 25), Three-15 km Run, and Seven-10 km run along with One-5 km and 3 km run just within a span of 1-year. 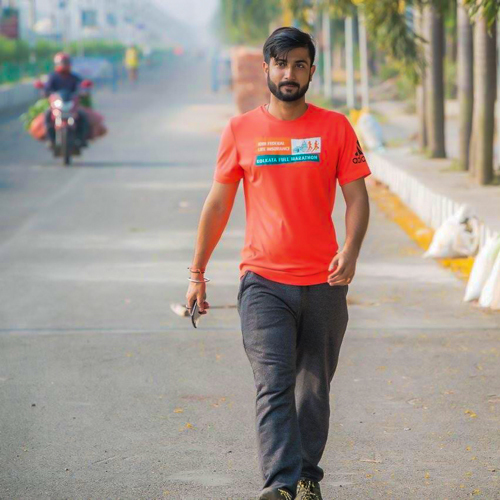 He completed a total of 23 runs in one year in several categories across India including in the major cities such as Kolkata, Mumbai, Delhi, Hyderabad, Guwahati, Vishakhapatnam, Delhi, and Bengaluru. People in Kolkata Running Circuit was astounded by his performance and was praised by many including the creator of Kolkata Runners Sandy Madan, Ultra Runner Jaydev Raja, Wonder Girl of Kolkata Prema Raja Ram. He was also escorted by International Athlete Arun Kr. Singh in various aspects of running of Do’s and Don’ts which unfolded many venues for Anupam. He completed his first full-marathon held in Bangalore. After finishing his marathon, one of the Kolkata Runners caught him crying near the finishing line, Suchitra Senanayake. Jaydev Raja said to him, “Anupam tum mere sai maar khayega agar tum roya, tumko aapne upar proud feel hona chaiye, tum wo Kiya jo aajtak running circuit mai within one-year koi nei Kiya”. Completing a full marathon in one year span is not easy with mere 8-months of running workout. He also established Happy Feet Howrah on 11th April 2017, which was the first running group formed by combining Howrah and Hooghly Districts. This group was created after he spoke with Sandy Madan in a collaboration run hosted by Salt Lake Runner at Eco Park in May 2017. The same was approved by Sandy Madan, the creator of Kolkata Runners. This was done in the subsequent collaboration run hosted by Kolkata Road Runners at Red Road in front of other running circuits of Kolkata. He raised HFH with mere 5-10 runners with all his perspectives along with his additional ongoing career life. He strive to make everything efficient. Till this date, HFH attained more than 100 passionate runners and got remodeled to Happy Feet Runner. From a few members, Anil Agarwal, Vineet Kedia, Subhashish Ghosh, Neha Kedia, Jyoti Agarwal, Amit Bhatia, Anujj Saraswat, Praveen Sharma, Mayank Sharma the group has emerged to a huge crowd. However, Days changed. He no longer could handle everything at once. His professional and educational pursuit was bit affected. So, he stepped back and gave up the running group in the assistance of other members to regulate the same. Although he is far away from the group now, his work, mission, and achievements are still honored by the members, to whom he assisted from top to toe for 24 hours. Owing to his accomplishments, he was conferred to become the Kolkata Pinkathon Ambassador which is an achievement in itself. Without any difficulties, he along with the help of ladies Jyoti Agarwal, Neha Kedia, and Bobby Bhatia brought more than 85+ registrations in a Pinkaton event motivating the newbies. He also monitors training at Gulmohar for ladies every Saturday. 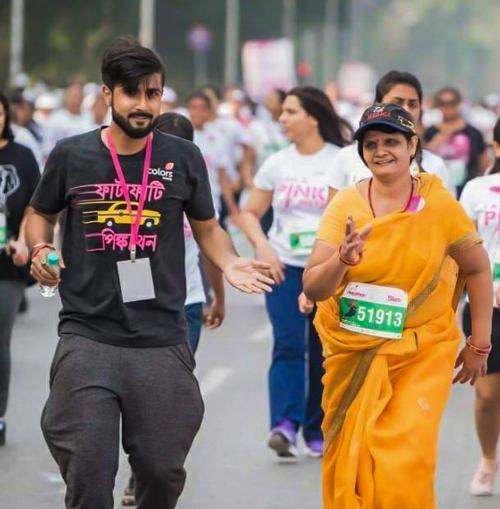 This initiative began from his home, while he motivated his Mother, who completed her first 5km run in 1hour 05 minutes. Milind Soman was proud of his achievements for same in a short passage of time. He was recently awarded as a TUFFMAN Brand Ambassador by the founder of Tuff man Sanjay Mangla. He was also selected as a 10 km pacer at IDBI Kolkata Run 2017, which was also his part of his achievements in 1 year of his running cycle. Currently, he is preparing himself for upcoming Ultra Runs and Stadium Runs. We wish him a best of Luck for same. If a guy suffering from an Asthma can achieve to a great extent, why can’t a normal person do the same? 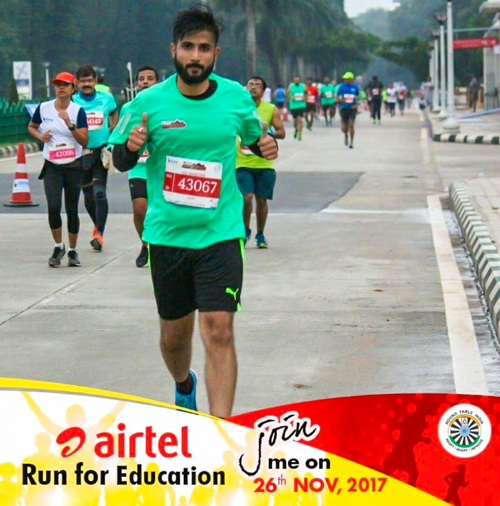 We are exceedingly proud and honored to have Mr. Anupam Mishra the TUFFMAN as an active part of our flagship event Airtel Run for Education. He is a sole inspiration for himself and an example for the masses who consider breathing issues as a hindrance in running. We wish you all the best and we hope he will always be there with us for our future endeavors. Great going Anupam. Wishing you good luck.